If you travel by car, it will take exactly 7 minutes to get to this ancient piece of architecture, a bit more if you walk. Shevchenkove was a part of the suburbs of the capital of Halyt’sko-Volyns’ke duchy – Halych. The explored site of ancient settlement is 10 sq. hectares. It had an urban character. V.K. Honcharov is inclined to think that there had been a monastery on this place, some other – boyar courtyard. Anyhow, there had been an well-strengthened advanced post with though-out system of walls and ditches which included some natural elements of the rivers Limnytsya and Dnister. It is a great luck that such a unique monument of ancient duchy has preserved till our times. To see it it’s really worthy to turn to the right from Rohatyn-Ivano-Frankivs’k route. The church was built in 1194 and is situated in the centre of the site of ancient settlement. 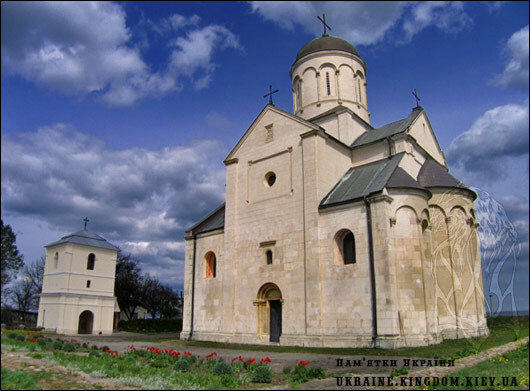 Its founder was the duke of Halyts’ko-Volyns’ke duchy – Roman Mstyslavych which is written on the southern front of the church. Roman’s grandfather was the great Kyiv duke Izyaslav who according to the ancient Christian tradition, when baptized, had another name Panteleymon. 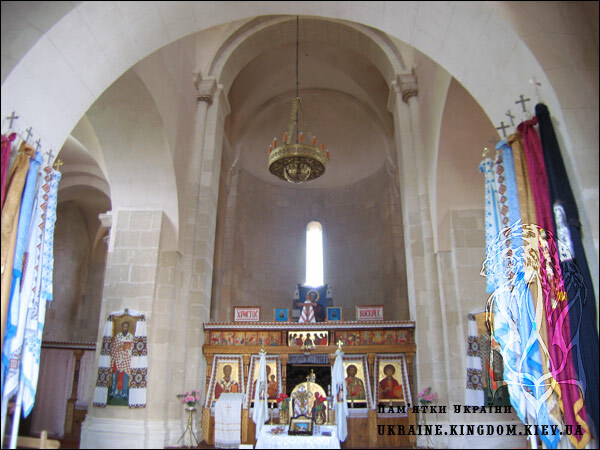 It is considered that Roman Mstyslavych built this church to honour his grandfather. When this land were under Polish rule, church was turned into cathedral and re-sanctified, after this it had a name of St. Stanislav. 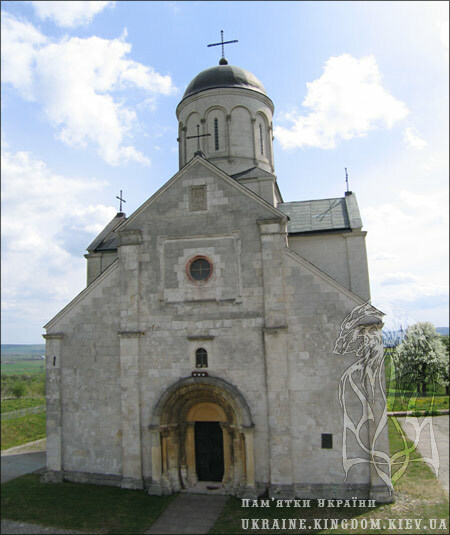 Before the transfer of Latin parish to Halych in 1427, it was a Roman-Catholic church, then it became the summer residence of Latin bishops. In the documents of Halych eldership of XVIII century there’re lines that say about |”the lonely church in the fields”. And now walking from the neighbouring village to the church one can definitely recollect these words. In 1598 the church was granted to Franciscan Order on terms that a monastery would be built near it. When the church was restored, its architecture forms changed and now had the features of basilica in baroque style. Nearby the buildings of the monastery were situated. All buildings were surrounded by ramparts and the whole complex looked like a fortress. But it didn’t save it from the Turks. 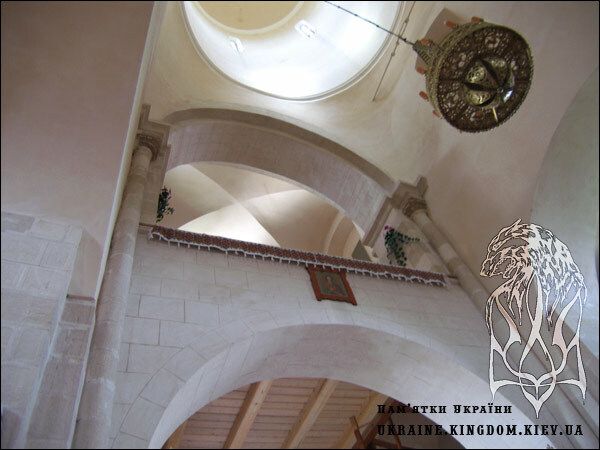 In 1676 the army at the head of Ibrahim Shaytan-Pasha ruined partly the sacred building. Though this event cannot be compared with the fire in 1802 and times of First World War. In 1915 the church was under cannon fire. The fronts, belfry, roof and the interior were hardly damaged. In the archives I saw the reminiscence about the signs of fresco paintings that had been found on the stone blocks during the restoration in 1926. Now everything is painted in white inside. 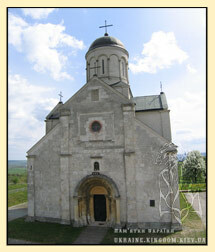 After the restoration and till 1991 the church had almost the initial look and was still under construction. At this time cardinal Ivan-Myroslav Lyubachivs’kyy who studied in theological seminary in Shevchenkove took it under his protection. At this time the real renascence of the church began. Now the church looks the same as in the times of Halyts’ko-Volyns’ke duchy. Still some signs of its Catholic past can be traced in its portals which are usual in the Romanic architecture of the Western Europe. Old Rus church together with her protector St. Panteleymon holds the strength of the faith and steadfastness. Having been a part of different confessions, having lived through territorial and political divisions and directives, it stood fast because of the human apprehensibility, chariness, God’s will. It stood fast to show this generation the importance of preserving and valuing ecclesiastical and cultural heritage of our country. 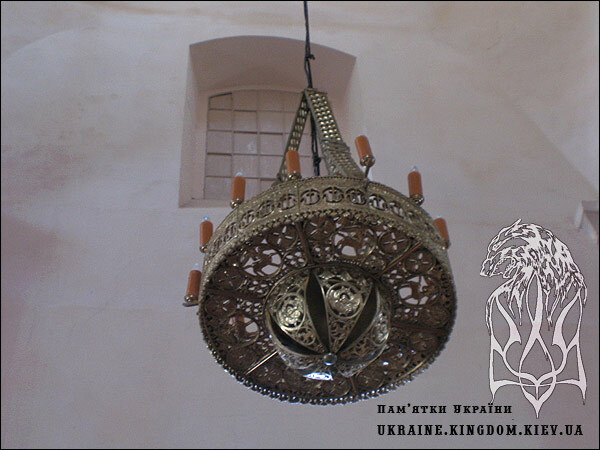 The church of XII century was born as Orthodox, made its way though Catholic Orders and now is a part of Ukrainian Greek-Catholic Church. But when you see this sacred monument such a diversity of confessions make one clear and firm core – Christianity. Photo made on 30th of April, 2007.